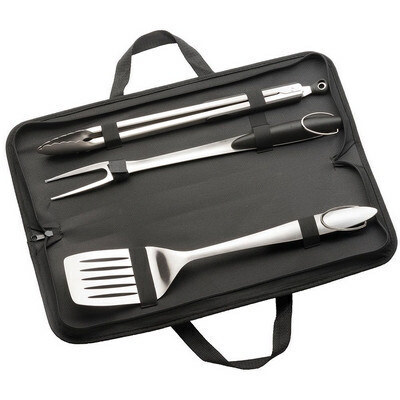 Description: Comes with spatula, fork and tongs made from high grade stainless steel and comfortable silicon grips. Features: The zippered carry bag is made from polyester and internal elastic holders for the utensils. Packaging: Plastic Bag Colour: Black Material: Stainless Steel with silicon grips. Polyester carry bag Product Size: Bag: 515mm(w) x 165mm(h) x 50mm(d) Freight details : 10 per carton, 12kgs, 53.5 x 36.5 x 24.5cms; Decoration Type(s): Colour Print / Full Colour Print / Laser Engrave Decoration Area: Print: on bag 330mm(w) x 70mm(h), Laser: on utensils 30mm(w) x 10mm(h). Price includes : 1 Colour 1 Position Print. Setup is included.